Yet still forbidden. It WILL get censored once spotted / reported. While the behaviour of said named and shamed individual might be destructive and worthy of shaming, doing so with his name is against the CoC. And since two wrongs don't make one right, it is just prudent to notify OP that this is not the way to go and will not be tolerated by the moderation team. Großer doesn't mean "greater" in that regard, just "great". The name actually refers to "Friedrich Wilhelm von Brandenburg" who earned the nickname "der Große Kurfürst" in battle. He already was "Kurfürst" which means "prince elector". The seven prince elector were the princes/kings/archbishops that would be allowed to vote on who would be Holy Roman Emperor since it wasn't a hereditary monarchy. Back to Friedrich Wilhelm von Brandenburg. The full name when addressing him would have been "Großer Kürfurst Friedrich Wilhelm von Brandenburg" thus "Großer" with "r" in the end is only used when addressing the person directly. If you refer to his title alone, it would have been "der Große Kurfürst". The ship was named for him and thus the "Großer Kurfürst" albeit ommitting the rest is the correct name. Ask again when the browser finished loading. It showed this as the latest post and I didn't pay attention to the date. There are some exceptions where some ships were addressed with the male pronoun either by their commanding officers or even most people. 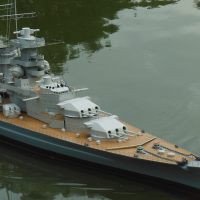 It didn't stick and for quite some time ships use the female pronoun ("die") in German when addressed by name, although the pronoun for the noun ship itself would be neutral ("das Schiff"). There might be some exceptions for when the commanding officer or even the majority of the crew refer to a ship with the male pronoun, however it won't hold with the general populace. If the ship class is meant, then the female pronoun is always used. The pronoun for the word "class" is already female ("die Klasse"). Cars and planes on the other hand - while also having a neutral pronoun for the word car ("das Auto") and plane ("das Flugzeug") - are referred to as male in German when addressed by specific type like "der 3er (BMW)" or "der (Audi) A3" or "der A320". Incidentally, when referring to a special plane by name, then the pronoun used is again the female one "die Landshut". Yeah and the rest of the time he's just a troll. The Language Barrier in game. The question in that case is rather not why he is obnoxious but rather why the account has access to T10 ships. Leaked press account or something? Since John Doe is the default name for an unknown person, it might be that they just want to get back at whoever sued them regarding Steven Segal. Or it could very well be Warner Bros. - who are holding the rights to "Under Siege" - came out of the blue and they just had to comply in short notice. On the other hand, the random name generator does come up with names of real life people, see the captain that came with my Gaede and has the name of a European Comissioner. As for permissions, that would often come down to the respective legal system of the country. I'd think all of the people that could be forwarded for this are now dead and part of history. The biggest problem would be using photographs since copyright on those can last up to a century after the original creator's death. The uniforms themselves etc. rather wouldn't since they are mostly outdated. Since it's a (mostly) BB associated commander, another possible alternative would be Willis A. Lee for the American side. Commander of Battleship Division Six during the battle of Guadalcanal. Honestly, I'm not mad at removing Steven Segal, but adding a real replacement would have a nice touch to it. It says: Our new TS: 8531.zap-ts3.com! Discord will remain available of course. Discord is this little thingy.